The finale of the Northern region was held on 4th October, where the three winners beat 26 participants with their unmatched bartending skills. The participants exhibited extreme bartending knowledge and showcased their talent behind the bar by mixing great-tasting cocktails – all while tossing, balancing and flipping bottles in the air. This season of Cup has garnered a massive response with immensely talented bartenders from some of the best institutions. The participants got a chance to showcase their ace skills to judges like Yangdup Lama, Sandeep Verma and Goutam Bhimani. Prior to Delhi-NCR, the event had successful regional rounds in Bangalore, Mumbai and Pune. The final winner will be chosen post a grand finale in Gurgaon on 7th Oct and will represent India at MONIN Cup 2016, France. 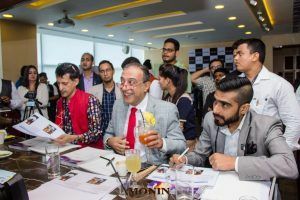 Commenting on the occasion Mr. Ravi Kathuria – Director Business development SAARC countries said, “We started this Cup in the year 2010, and today it has grown to another level; we have got incredible response by some of the young talent in the field of bartending. The Delhi zonal round was fun & exciting wherein the judges had a tough time choosing the finalist considering each participant raised the bar of the competition. 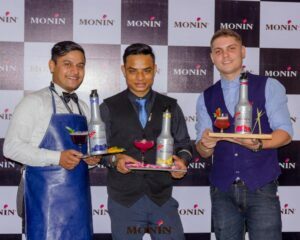 Commenting on the occasion Mr. Ashish Dubey – Managing Director, Saksham Impex said, “I would like to thank all bartenders for using Monin as their brand of choice in their drink offerings & for the trust they have in us. My extended thanks to young bartenders who participated in This cup with such great enthusiasm. Thanks as well to all judges especially to Shatbhi Basu & Sandeep Verma who have been associated with the brand since beginning and helped us launch the brand in India way back in 2003. 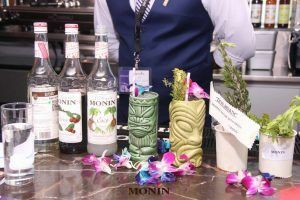 With 100 years of experience MONIN has a became a brand of choice of the gourmet flavour business with over 140 flavours in more than 145 countries. MONIN is the brand of choice of the creative beverage makers, from barista in coffee shops, through mixologists creating high-end cocktails, to operators offering simple cocktail solutions.